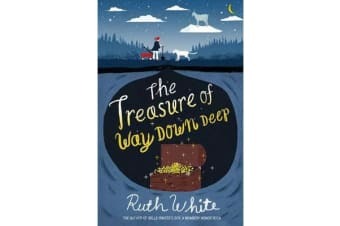 When Ruby Jolene Hurley sees the shadow of her dead pet goat Jethro dancing on his grave, that’s the first hint that something strange is going on in Way Down Deep. Then on Halloween night, Miss Arbutus senses an evil wind blowing into town, and bad things start to happen. The coal mine shuts down, one hundred men lose their jobs, and all of Way Down feels the pinch. Ruby thinks the answer to their problems is the treasure that Archibald Ward, the town’s founder, supposedly buried more than two hundred years ago. Most people say the treasure is just a myth, but Ruby is determined to prove the naysayers wrong and save the day.